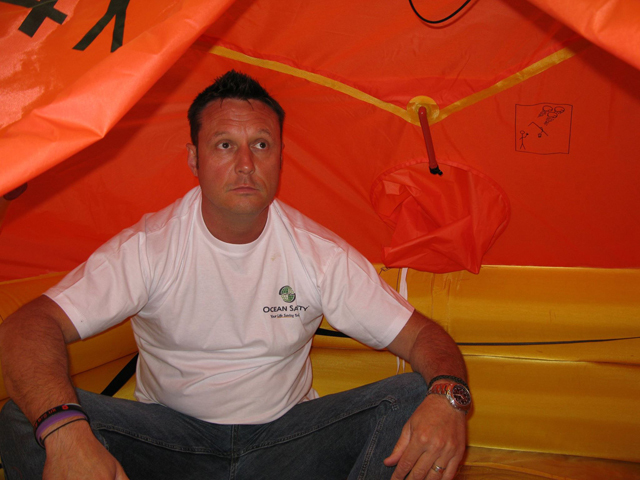 Former soldier Wayne Ingram will be spending seven days and nights in the confines of a life raft this May. The charity challenge and scientific experiment will take place between 18 and 25 May 2015 at Portland Marina, Portland Harbour, Dorset. Wayne says: ‘This is a twofold exercise, firstly to raise money for Great Ormond Street Hospital families centre, and secondly to allow Professor Mike Tipton and his team at Portsmouth University conduct experiments on me. He added: ‘Professor Tipton and his team have become involved as they want to gain valuable information from my actions, so I will enter the life raft as in a survival situation. ‘I will only have a small grab bag, allowing me to take a small amount of clothing and only one day’s food and water, so forcing me to survive the remainder. The information my body generates before, during and after will then allow his team to understand how one copes in a survival situation, potentially allowing others caught within a sea rescue, or mountain rescue to make the right decision, allowing them to survive. Click here to find out more about the charity challenge. Visit Wayne’s Just Giving page here.